I love Foodie Fights. This is my 4th battle, and each one has been a lot of fun. When I first started blogging just over a year ago I had no idea such a thing existed. I found it by accident when I followed a link embedded in a comment on a blog post I was reading. A Iron Chef-type contest for food bloggers? I immediately signed up and am so glad I did! This battle is Sesame Seeds and Star Fruit, and lucky for me, my grocery store actually had some in stock :) I brought three of the fruits home and started looking on the internet for ways to use them. I knew you could use them in salads (a favorite way because it showcases their very cool star shape), but was surprised to learn you can also cook them in both sweet and savory dishes. I tried really hard to figure out a way to use them on a grilled pizza, but decided the chances of it ending badly were too high. Then I read about chutneys and compotes, which led to me come up with this layered shortcake-type dessert. I made a compote (a cooked mixture of fresh and dried fruit) with star fruit, Gala apples, dried cranberries, vanilla, lime, ginger, and cinnamon. The smell in my kitchen as it simmered was luscious; the lime, ginger, and cinnamon blended perfectly. The finished compote was a smooth combination of flavors: spiced, and at the same time, sweet and tart, with the texture of perfectly cooked apple pie. For the "cake" I made buttermilk biscuits with my Buttermilk Pancake Mix. I added sesame seeds--toasting them first to give them a nutty flavor--to the mixture and also on top of the biscuits. They are fabulous eaten alone (which we did with the first batch), and go really well with the flavor of the star fruit compote. I was actually a little surprised by how nicely they went together. Star fruit and sesame seed aren't two flavors I thought would work, which makes the final dessert even sweeter. Click here to go to the battle page and view all of the contestants. Of course, I'd love for you to vote for me! :) Thanks! Note: Make the compote a couple hours ahead of time so it has time to cool to room temperature and thicken. 1. 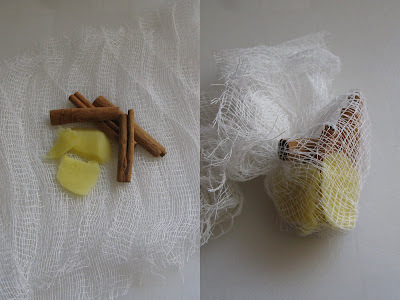 Wrap the cinnamon stick pieces and ginger in a double-layer of cheese cloth and tie it closed to create a small bundle. Set aside. 2. Combine the water and sugar in a medium sauce pan and heat over medium heat until it the mixture simmers and the sugar is completely dissolved. 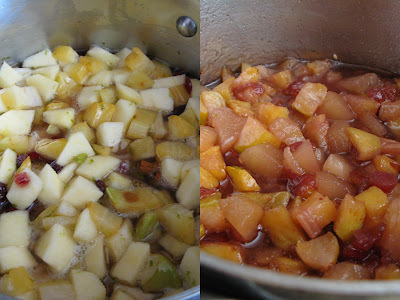 Add the star fruit, apples, cranberries, lime zest, lime juice, salt, and cinnamon-ginger bundle. Bring the mixture to a boil, cover, and reduce the heat to low to maintain a simmer. Cook, stirring occasionally, for 40 minutes. Then uncover the pot and simmer 10-15 more minutes, or until the liquid is reduced to a thick syrup. Stir in the vanilla, remove from the heat and let cool to room temperature. 1. 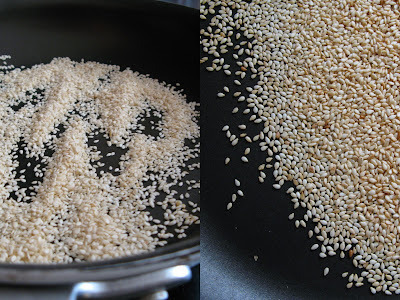 To toast the sesame seeds, heat a medium skillet over medium heat. Add the sesame seeds to dry skillet and heat, stirring almost constantly, until they are fragrant and golden brown. Transfer the toasted seeds to a bowl to keep them from browning more as they sit in the hot pan, and reserve 1 tablespoon in a separate bowl. 2. Heat your oven to 425 deg and line a baking sheet with parchment paper. 3. In a medium bowl, combine the Buttermilk Pancake Mix, toasted sesame seeds (minus the 1 tablespoon reserved), and sugar; stir to mix. Add the cold butter and cut it into the dry ingredients using a pastry blender until most of the butter is the size of small peas. 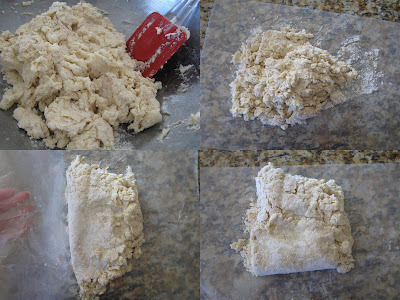 You can do this in a food processor if you want, but I'd rather just dirty the pastry blender and have less to wash.
4. 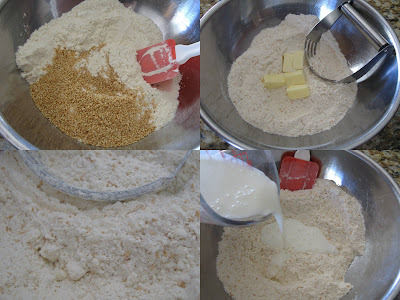 Add the buttermilk and use a rubber spatula to mix and press the dough together. Turn the dough out onto a piece of waxed paper sprinkled with extra pancake mix. 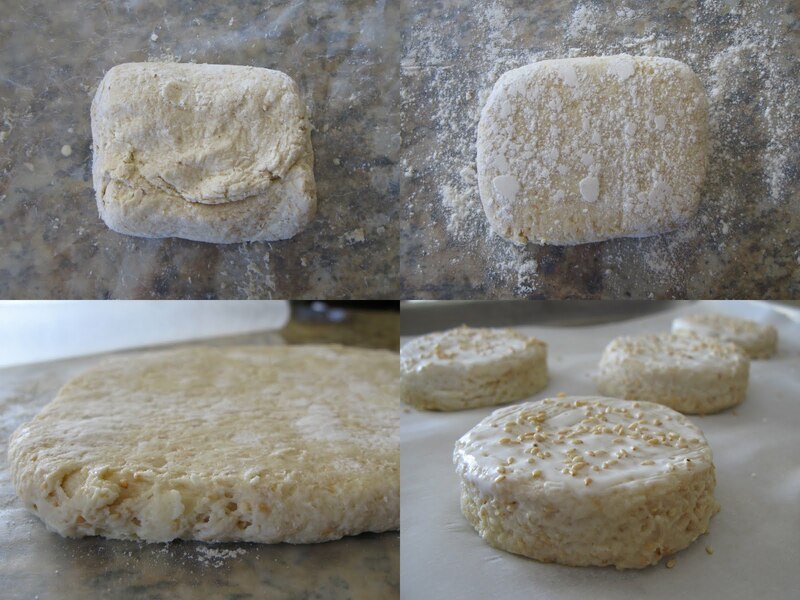 Use the waxed paper to fold the dough in half, pressing it gently together. Repeat with each side until the dough has come together to form a nice square, about 2 folds per side. 5. Sprinkle the top of the dough with extra pancake mix, lay a piece of waxed paper on the top, and roll it out to about 1/2-inch thick. Use a 3-inch round cookie or biscuit cutter to cut out the biscuits; gather and gently re-roll the scraps to get 8 biscuits total. Brush the tops of the biscuits with the cream and sprinkle with the reserved toasted sesame seeds. 6.Bake for 12-14 minutes, or until the tops and bottoms are just barely golden brown. 7. To serve, split the biscuits horizontally and layer the following: the biscuit bottom, about 1/4 cup fruit compote, whipped cream, biscuit top, about 1/4 cup fruit compote, whipped cream. Drizzle the plate with some of the compote syrup and garnish the dessert with mint and crystallized ginger if desired. Note: The compote recipe doesn't make enough fruit for all 8 biscuits. Please double the recipe if you want to serve all of the biscuits. Looks amazing. Well done and good luck. The compote sounds yummy. Lucky you, you found the elusive star fruit.